For the last few years I have put together a post to detail some of the top conventions in the UK fitness calendar. This post has proved to be so popular that I have decided to put together another one for some of the massive fitness events that are going on over the next 12 months. As with last year I will be attending a number of them so give me a shout if you will be too! This expo is held at ExCel in London that is focused on group exercise and all that Jazz! The event has some massive classes were you can take part in sessions delivered by some of the master trainers from Zumba, Les Mills, Clubbercise and many more. If you like GroupEx and are looking for a high energy event to attend, Move Fit is well worth a look. This is an event aimed at the female fitness community of the UK, the event brings together a number of industry leaders who deliver talks and classes during the event. This is a convention that aims to bring together a number of groups in the world of exercise and fitness. This is done with the aim of promoting higher levels of physical activity and lowering obesity. This show really has something for everyone involved in health fitness and physical activity. Read my review of Elevate here. This show is aimed at those involved or who would like to be involved with elite sport. The show showcases some of the latest technology and ideas to help performance coaches, physiotherapists, club doctors and other elite sports professionals get the most from their athletes. It is free to attend, held at ExCel in London and well worth a visit! Another free to attend show hosted at ExCel London, co-located with Elevate and ESP. This show is focused in on those involved in rehabilitation so covers occupations such as physiotherapists, chiropractors, and osteos. The event showcases some of the latest rehabilitation technology and systems, with seminars form some of the leading lights. This is now a massive expo that is held at the NEC in Birmingham, it is mainly focused in on the worlds of strength, power and mass, and is open to both industry professionals and the public. Over the past few years this convention has seen exponential growth! Check out my full review of Body Power! 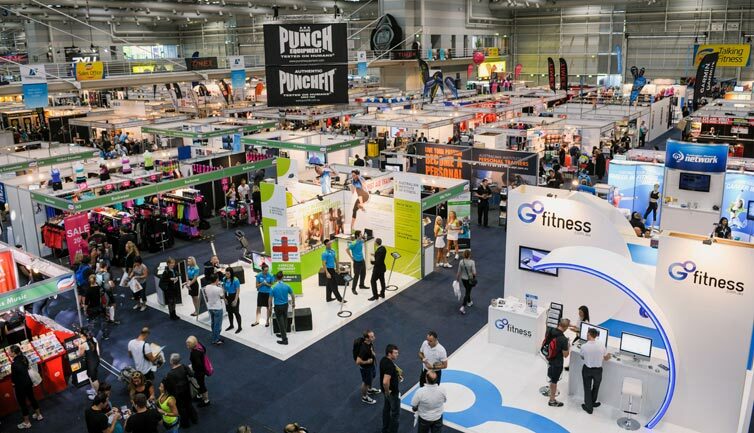 This trade based show runs alongside Body Power and brings in some of the best kit, technology and products from around the fitness industry and presents them to trade buyers. So if you own a gym, shop, training company this part of the huge Body Power show is a vital part to attend. This conference is a great one for all of you that are involved with strength and conditioning, the sessions tend to be more technically focused. The convention always has a great line up of speakers from the world of Strength and conditioning, and if you are into training people for a sport it is well worth a visit! This is one of the newer events in the fitness calendar, that has been growing steady over the last few years. 2018 promises to be a great event especially for those in Scotland as it is right on your doorstep! The event has some great names already confirmed and looks to be a great couple of days with seminars, demos and a wide range of stalls! This is one for all the exercise scientists out there. The venue changes annually and this year will be in Harrogate. This is a great one for all those involved with sports and exercise science of all disciplines. The conference always has a great range of speakers, from a wide range of backgrounds. This is the oldest and most established conventions, it is aimed at Fitpros, it is held annually at Loughborough University and is made up of a number of a wide range of both practical and theory sessions form some of the leaders in our industry. Well worth attending! If you know of any fitness events in your area please do stick them in the comments area below! Hello i am a personal trainer from staffordshire. We have a new fitness Aid that we have designed and weights that we have patanted and we were wondering what fitness convetion we could get involved with to show case our new product. Im also looking for some information regarding branding my own fitness class with the product we have designed. We really hope you can help. Thanks Stephen, sounds like an interesting project. Hard to say what would be the best for you without knowing a little more. Maybe if you shoot me a message on the contact page we can discuss this in more detail! Great Article Tom.really helpful. Im based in London and currently exhibiting my company StrongHer at MoveFit at the excel its new this year and there is one in Angel on the 26th April (for women only) called Be:Fit which is pretty popular. Thanks Lyanne, glad you liked the post and I will be sure to add those to the list for 2018!! Thanks for the comment, glad you have found the post useful!! I would suggest the BP Trade Show as being the best one for you. Have a look at the link in the post to the site and contact them, you have 11 months till the next one!